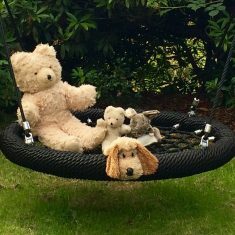 Our basket swings are a wonderful way for many children to play together and have fun. 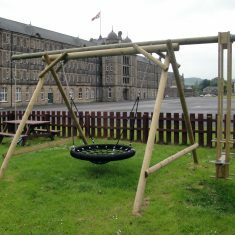 There are three types of basket swings available as part of our wooden play equipment for the garden range. 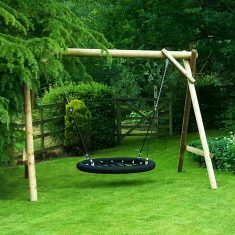 The standard Basket Swing has a good solid frame made from round timbers that the basket hangs from. The second type (Family basket Swing with Double Extension) is essentially the same as the standard basket swing however it has the top pole extended on both sides. 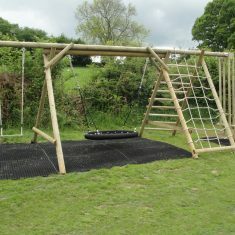 This allows for a selection of swing seats to be added and therefore increasing the play value considerably. 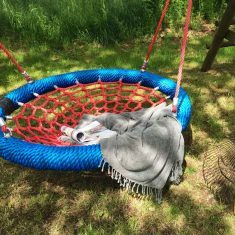 Finally there is the option to add a net frame creating the Family basket Swing with Ladder and Net and Double extension. 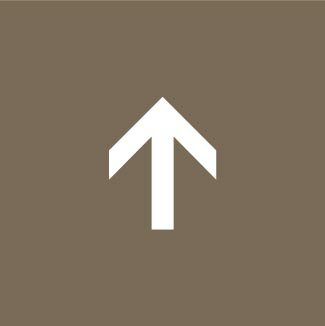 This product also has a climbing element.